For many people (or at least for me), the array of islands that make up the Caribbean Sea, West Indies, and The Bahamas can be difficult to keep straight. “The Bahamas are not part of the Caribbean,” my colleague and shipmate for the week, Peter Swanson, reminds me for the umpteenth time since I stepped off the plane. I have just arrived in steamy Nassau on New Providence Island by way of Atlanta and Seattle. 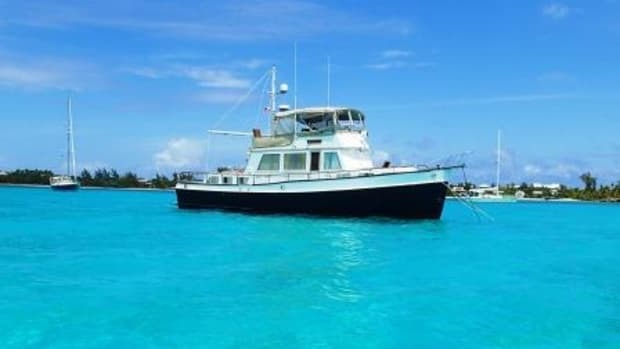 I am about to spend five August days exploring the Bahamian island chain called The Exumas. To many that read this magazine, the Exuma Cays are old hat (and you don’t have to be reminded that it is pronounced “keys”). But to someone like me from the Pacific time zone whose tropical vacations are usually spent on the less far-flung beaches of Maui or Mazatlán, they are a whole new world. Leaving the airport, my cab driver weaves a well-worn path through Nassau’s maze of roundabouts, avoiding trinket-shopping cruise-ship tourists like he’s in perfect control of a video game. Reggae music beats softly on the radio, and he’s driving casually, with one hand on the wheel and one elbow out the window. Forty minutes later we arrive at Paradise Island’s Atlantis resort. The resort is built on property once owned by Merv Griffin, and it opened for business in 1998 after four years of construction. The marina, hotel, condos, aquarium, casino, and luxury golf course that comprise the resort all feel like something torn from Walt Disney’s playbook. Atlantis is a place where words like “aquaventure” are invented—and if we’re lucky, it’s where these words stay. Twenty years on, the resort seems like it could use a fresh coat of paint, so I don’t mind that Peter and our two other shipmates are itching to untie the lines and get motoring. 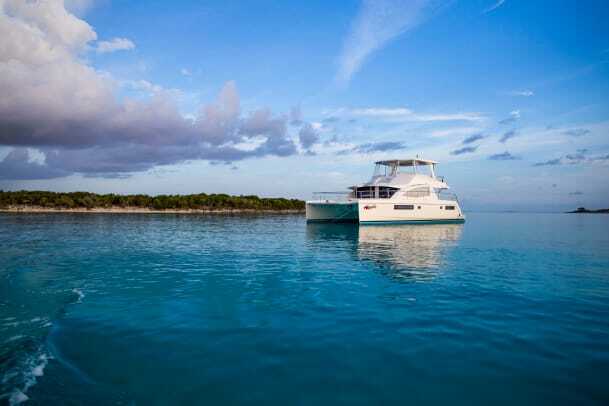 Our Moorings 51, The King’s Crown, anchored in an otherwise empty Allan’s Cay. But first we get the rundown on our charter vessel from Robin Cartwright, the station chief of The Moorings office here in Nassau. 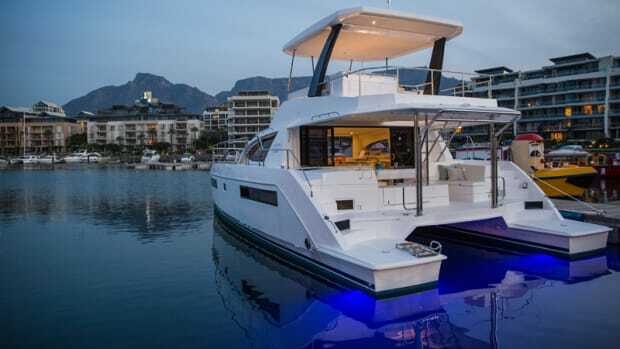 The Moorings, a well-known vacation charter outfit with outposts from Croatia to Tonga, has offered us a 51-foot powercat for the week, and Robin takes care to walk us through the ship’s systems and minor idiosyncrasies. She also offers itinerary suggestions so we can make the best use of our limited time. Even Peter, the only one of us who has cruised these waters before (on his 30-foot ketch, “ages ago,” as he says), finds Robin’s advice useful. 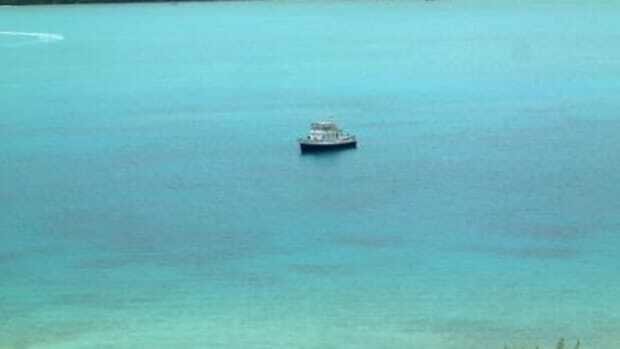 Once finished, we bid farewell for our first leg, a three-hour cruise across Exuma Sound. 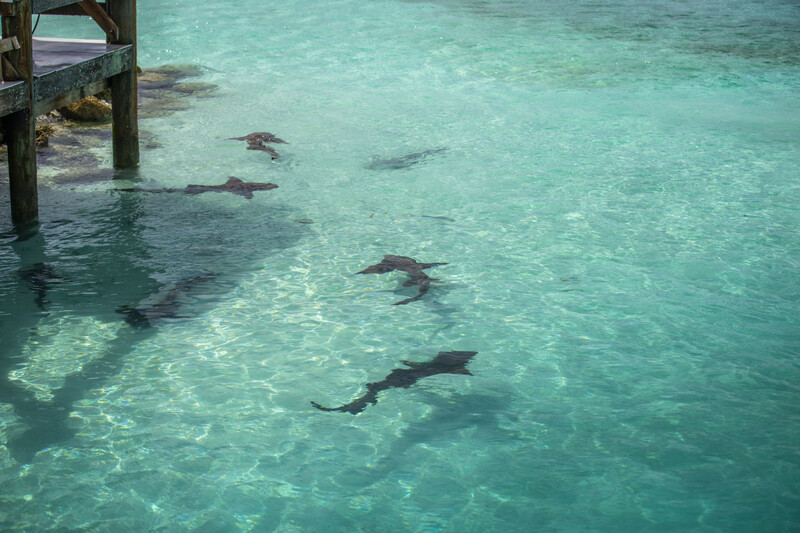 Reef sharks waiting for their next meal as the day’s fresh catch is gutted and cleaned at the marina in Highbourne Cay. The Exuma Cays resemble splotches of ink dribbled on a chart. They follow the shelf of the Exuma Bank, a shallow plateau that falls off suddenly into the Atlantic on the windward side of the cays. As we steam across the sound at what we determine to be an economical cruise of 12 knots, Peter explains that the bank is the reason for extreme currents in and around the islands: “Imagine a plate submerged under an inch of water; if you were to raise that plate, all the water would fall off very quickly at the exact same time.” The seemingly strange tidal patterns make a lot more sense when he puts it like that. 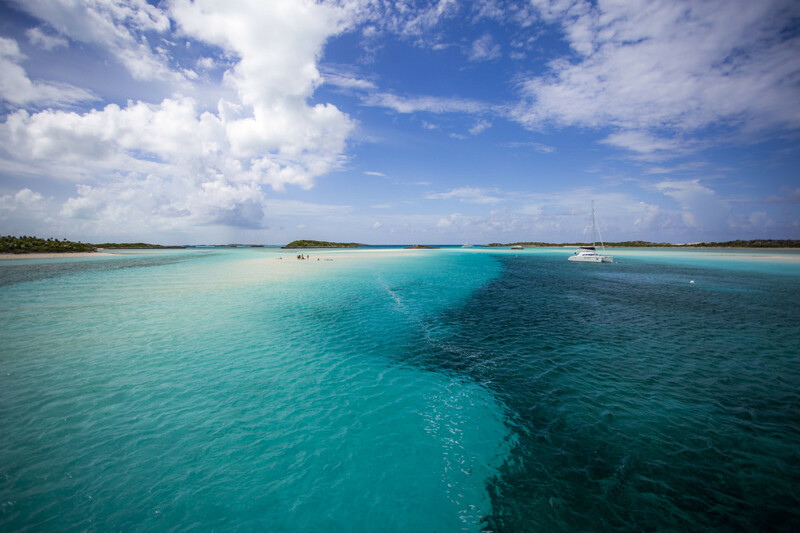 “An island for every day of the year,” travel brochures boast of The Exumas. 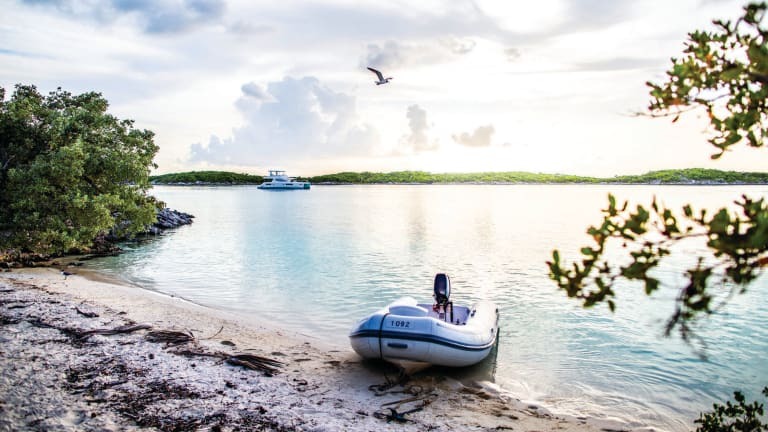 And if time allowed, we could have started from Grand Exuma, the southernmost point of the cays where you’ll find the capital city of George Town. 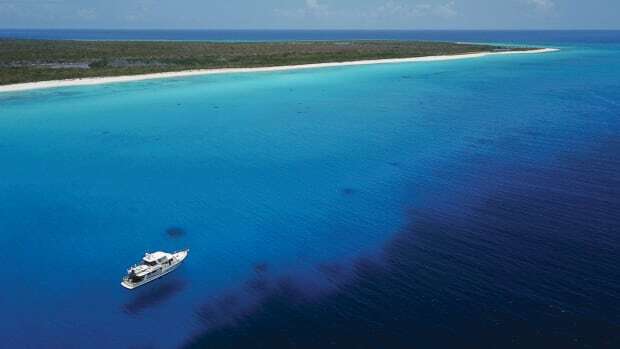 Sailing for roughly 80 miles north-northwest, we would have passed 364 individual cays and islets on our way to the northernmost point, Ship Channel Cay. But checking off all 365 islands was not on our itinerary this time. 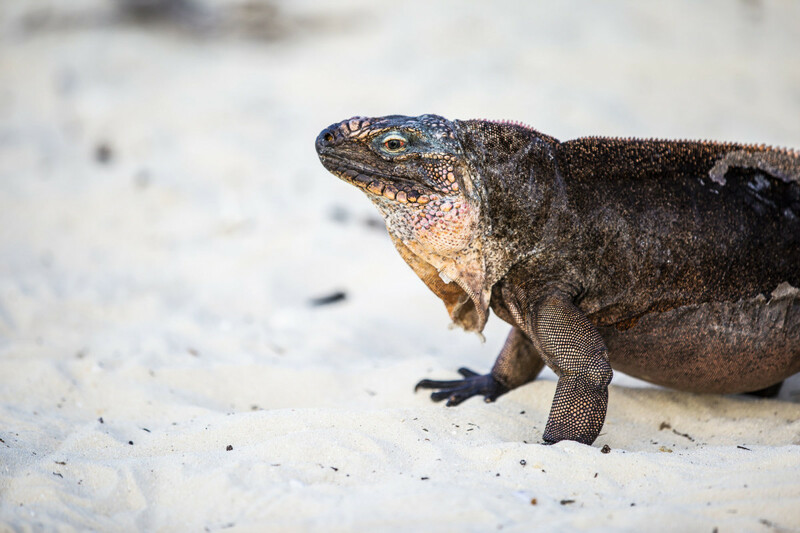 One of the largest of the friendly rock iguanas to visit us ashore at Allan’s Cay. Our first and most northern stop in The Exumas is Allan’s Cay, a horseshoe-shaped grouping of islets. We arrive as the sun is starting to dive into a thin layer of clouds, with no other cruising (or tourist) boats cluttering the anchorage. This is the benefit of cruising The Bahamas in August. We set the anchor in a patch of sand, and I make proper adjustments as the commands of our restive Captain Swanson cascade down from the flybridge helm. 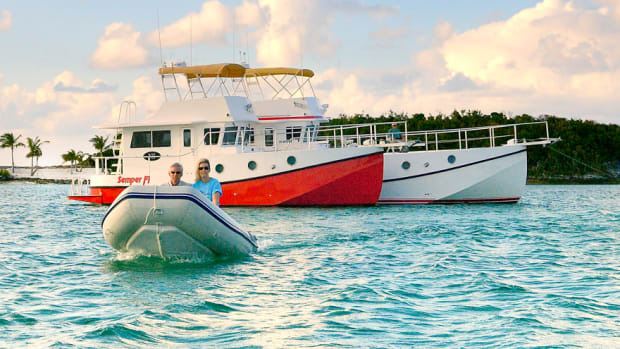 Proving that everything on a new boat needs to be rehearsed at least once, we eventually learn how to lower the inflatable and putter to shore to visit the cay’s only known inhabitants. 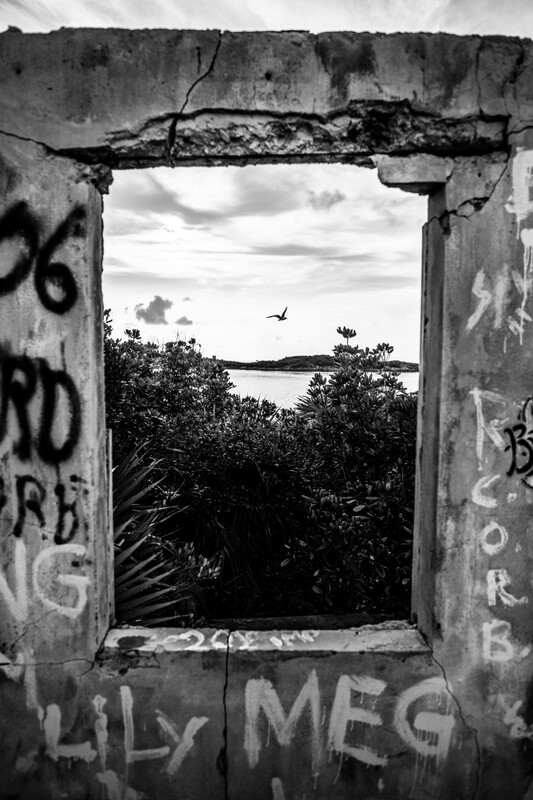 Allan’s Cay still boasts the ruins of a concrete structure—crumbling and graffiti-ridden, yet beautiful in its own decrepit way. 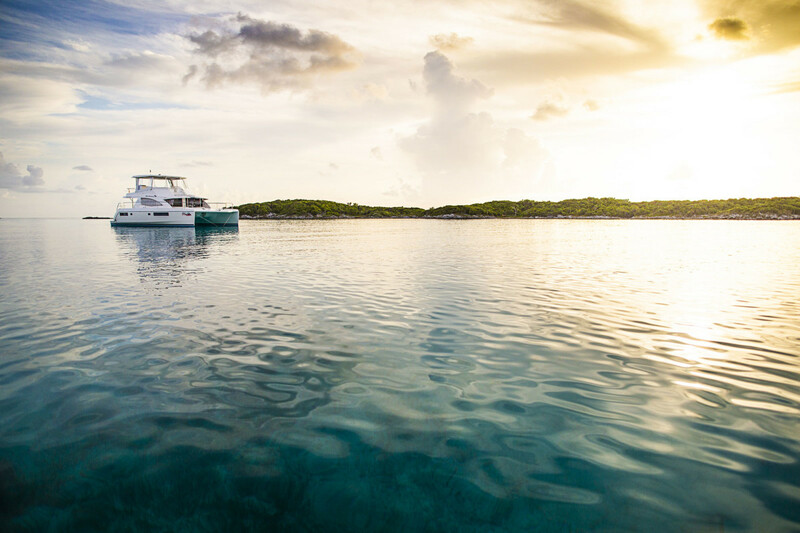 Allan’s Cay is one of the few islands in The Exumas that features an above-water wildlife experience. Here, rock iguanas patrol the underbrush and visit the beach when necessary, probably expecting a handout. It’s unlikely they are simply curious as two-legged foreigners like us arrive by the boatload every hour of every day. The iguanas are friendly and beautiful, the color of baked earthenware pottery with an accent of light-pink glaze. They are also just skittish enough not to entirely trust humans. At night, in the haze of sleep, I sense the wind picking up a bit, but our position holds fast and we rise to a new day, and a new objective. According to legend, a ship carrying missionaries went down on a nearby reef, and now, on windy nights, you can sometimes hear their singing. A sand bank at the horseshoe-shape anchorage at stunning Warderick Wells. 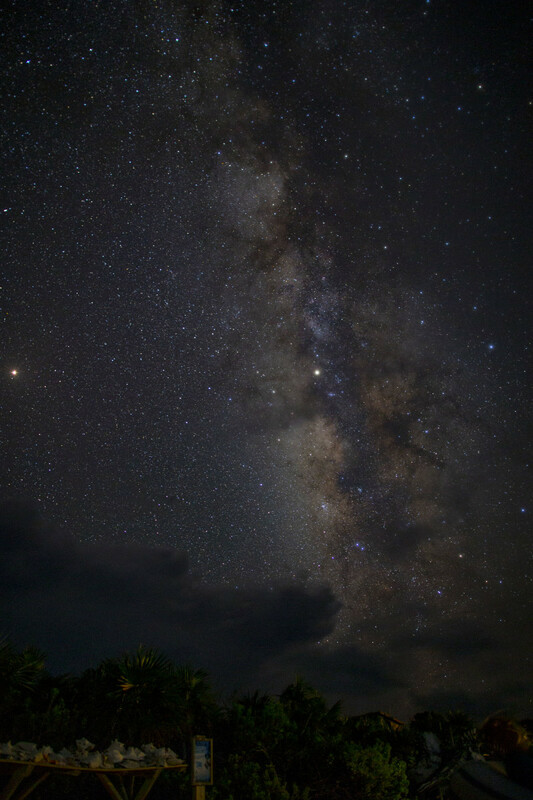 Photograph of the Milky Way from the beach at Warderick Wells. The entrance to the main mooring field is easy enough as again our low-season timing provides us the pick of the litter. Well, not exactly. We still have to follow protocol. Radioing the Park Visitor Center, we get a mooring ball assignment from Nicola Ierna, who, along with her husband, lives on the island. The couple handles just about everything on the cay including the various duties involved in helping protect the park. After dinner, Peter and I take the dinghy back to the beach to photograph the stars. This far away from population centers, we have theoretically perfect views of the sky, except for one nuisance: an active lightning storm that wreaks havoc with long exposures. Regardless, the evening brings a number of incredible sights that we often don’t get to see, including appearances from Venus, Mars, Jupiter, the Milky Way, and the Perseid meteor showers (see “Pilothouse” for my albeit amateur astrophotography tips). 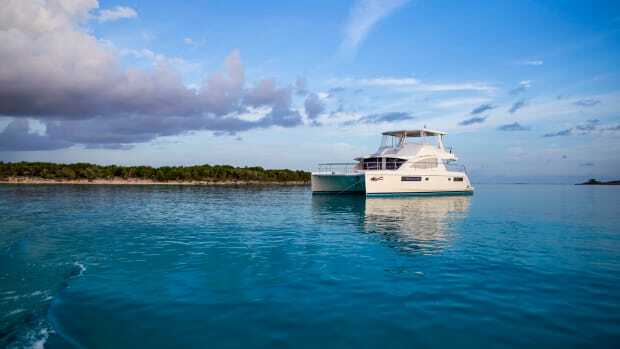 Facing the longest leg of our voyage (about five hours), we weigh anchor early and head southeast into a steadying breeze towards Staniel Cay, with a slight detour planned at Pig Beach on Big Major’s Spot. Peter and I decide to tow the dinghy in lieu of rehoisting it on the lifting swim platform, a decision that we come to regret two hours later as we watch our dear tender slowly recede into the distance. We sheepishly circle back to retrieve it, then use a much more secure tow line. Problem solved. This is the only time we have any seas, and though they aren’t much (closely stacked 3-4 footers), they are coming at an angle that causes us to drop boatspeed by several knots. Some residents of Pig Beach are enormous, while others, like this pig baby, are the size of a fully grown Labradoodle. 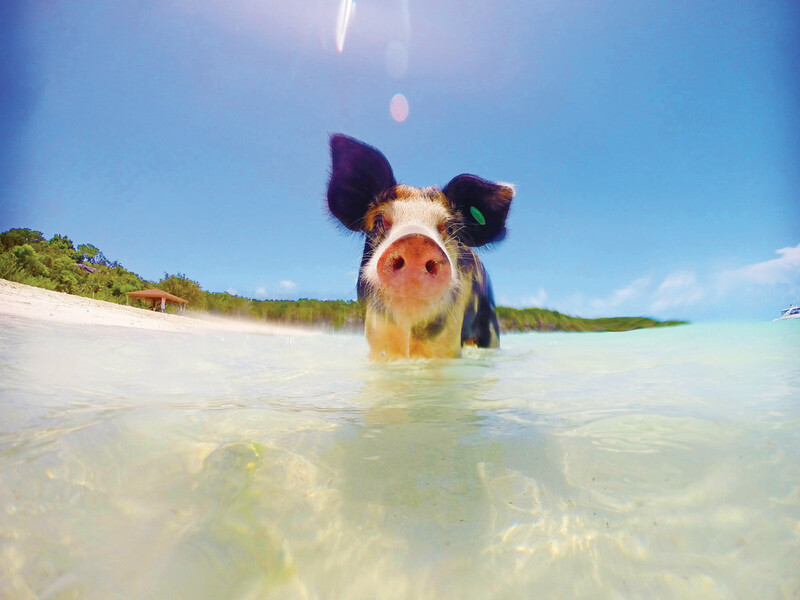 If you’re wondering what it is about Pig Beach that draws year-round crowds it’s this: swimming pigs. The beach is full of them. (And if you want to hear more about my up close and very personal experience with one of these swimming swine, the notorious Big Momma, read all about it in “Pilothouse,” October 2018). 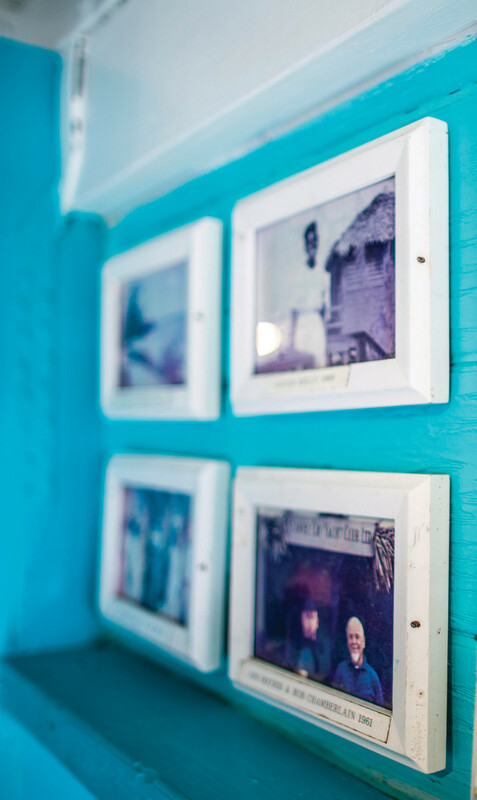 Preserving the history of the Staniel Cay Yacht Club in photos. In Staniel Cay we anchor and head ashore to reprovision at the village’s only open grocery store. 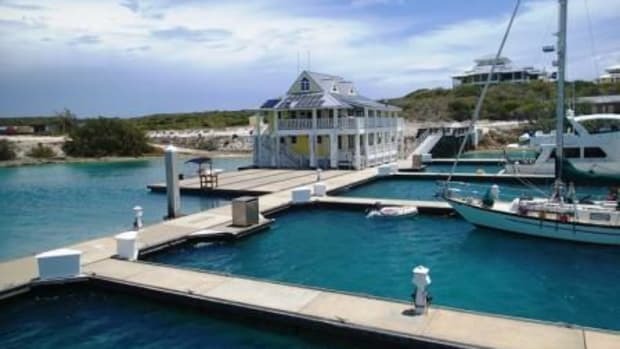 Staniel Cay has about 100 full-time residents and a private airport that largely serves the stash of homes that are perched on the eastern shore of the island. They are better described as palaces, as one, supposedly built by an investment banker, probably totals 25,000 square feet. The mansions dwarf everything in the village and represent The Exumas’ latest chapter as a continuing draw for the wealthy and famous like Johnny Depp, who fell in love with the area while working on a number of films (Pirates of the Caribbean, Blow) and bought his own small island nearby. 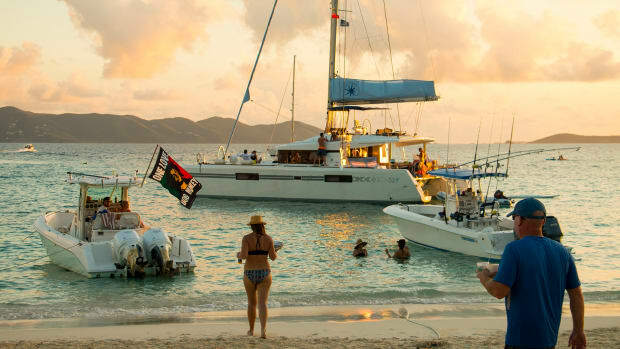 Depp and other celebs are said to rub elbows with everyone at Staniel Cay’s legendary and colorful yacht club bar where the only thing missing is WiFi. The bar is a throwback to olden days, complete with black-and-white framed photos that capture the yacht club’s colorful history, trophy fish mounted to the walls, and hundreds of yacht club burgees breezing from the rafters. 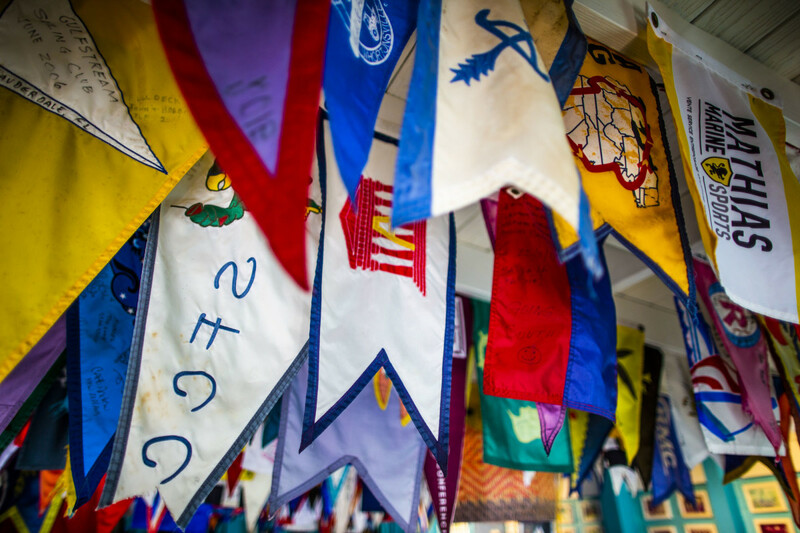 Club burgees hanging from the rafters at the Staniel Cay Yacht Club. On our return to Nassau we depart in the direction of Norman’s Cay, with a planned excursion to see Camp Driftwood at Shroud Cay. Shroud Cay is home to legendary Camp Driftwood, an encampment handbuilt in the 1960s by a sailing hermit named Ernest Scholtes. After a dinghy ride up a winding creek to a small beach, we hike up a worn path to what remains of the encampment. Though it’s the highest point we’ve summited during our brief adventure, Camp Driftwood is really not very high, measuring about 70 feet above sea level. In The Bahamas, though, 70 feet earns you panoramic views of these waters that contain every imaginable shade of blue and green. Until recently there was a tradition of leaving a small treasure behind in honor of the camp’s founding father. But park rangers scuttled the camp a while back, so it no longer holds the quaint fascination that it once did. The dinghy ride up the creek and the views from the top still make the trip well worth the effort. The most infamous footnote in the recent history of The Exumas was left by Colombian cocaine kingpin Carlos Lehder. The mastermind of the Medellín drug cartel, Lehder first invested in property on Norman’s Cay in 1978. From there he forced residents to move away, and purportedly murdered them if they wouldn’t comply. His desire was to make Norman’s Cay his own island empire for the cartel’s billion-dollar entrée into North America. He built a runway for his fleet of drug-smuggling planes, used attack dogs and machine guns to secure the beaches, and hosted epic, drug-fueled parties. Lehder was eventually extradited and convicted in the United States and has been serving multiple life sentences ever since. The skeletal remains of a plane still sit in the silt off of Norman’s, the result of a poorly taken approach to the 3,200-foot airstrip. Lehder was hardly the first to attempt to find a home for illegal activities here. The history of these waters is etched by lawlessness, greed, power, and other unsavory business. Centuries ago, the region was a playground for 18th-century pirates—meaner ones, even, than Depp’s Captain Sparrow. The pirate ships were light and fast enough to prey on Spanish galleons returning from their own plundering routes throughout the West Indies and South and Central America. Captains William Kidd, Henry Morgan (yes, that Captain Morgan), and Anne Bonney all staked claims to various ports and hideouts along these skinny reefs. Law and order caught up with most of them in gruesome ways: Only Bonney was clever enough to make it out alive, and little was ever known of her final whereabouts. Kidd was not as lucky. Tried and hanged for murder in a London court, he was left gibbeted in a cage to dissuade aspiring pirates. That must have worked because old-school pirating faded soon after and with it went the allure. After five days and an easy recrossing of Exuma Sound, we tie up at Atlantis Marina, dwarfed by the 100-foot yachts that surround us. 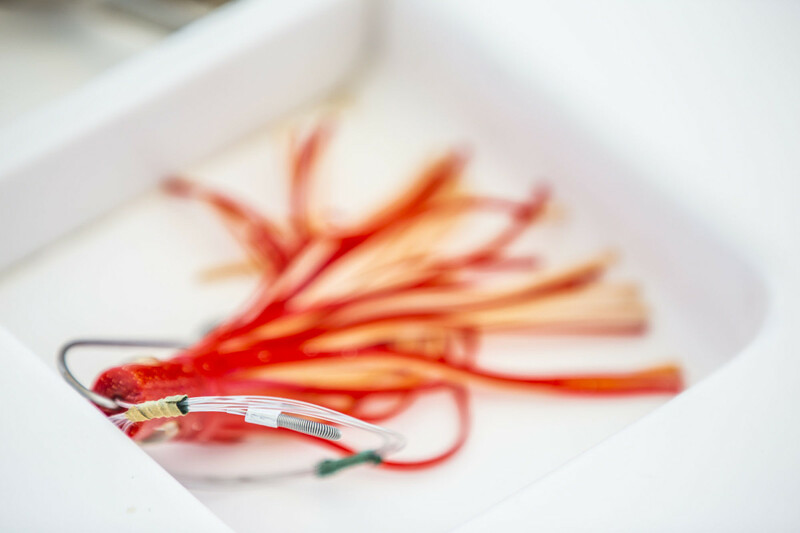 The Moorings experience was about what I expected: The boat ran well and the service was top-notch. What I didn’t expect was how much I would appreciate cruising The Bahamas in August. A true Seattleite, I’m a fan of neither heat nor humidity. But despite having both in spades, this summer cruise was extremely pleasant. The uncrowded beaches and uncluttered mooring fields and anchorages made for a stress-free, relaxing few days.